Next season the back-to-back NBA champion Golden State Warriors will move across the bay into their brand new, state-of-the-art arena in downtown San Francisco – Chase Center. The past few years the Warriors have taken the leap on the basketball court from a struggling franchise into the most dominant team in the history of sports. Now it’s time for the Dubs to take a similar leap on the sidelines. The Warriors are moving from the oldest, most outdated NBA arena into the league’s newest and most spectacular. The Warriors rise to one of the most recognizable and valuable sports organizations in the world will culminate with the grand opening of the magnificent Chase Center for the 2019-20 season. Despite the Warriors tremendous success on the court the past few seasons – and the enthusiasm of Dub Nation in the stands – there is no doubt that the Warriors are due for a new arena. Oracle Arena has lacked modern amenities, updated food options, and most of all – premium seating options that align with other top venues across the country. 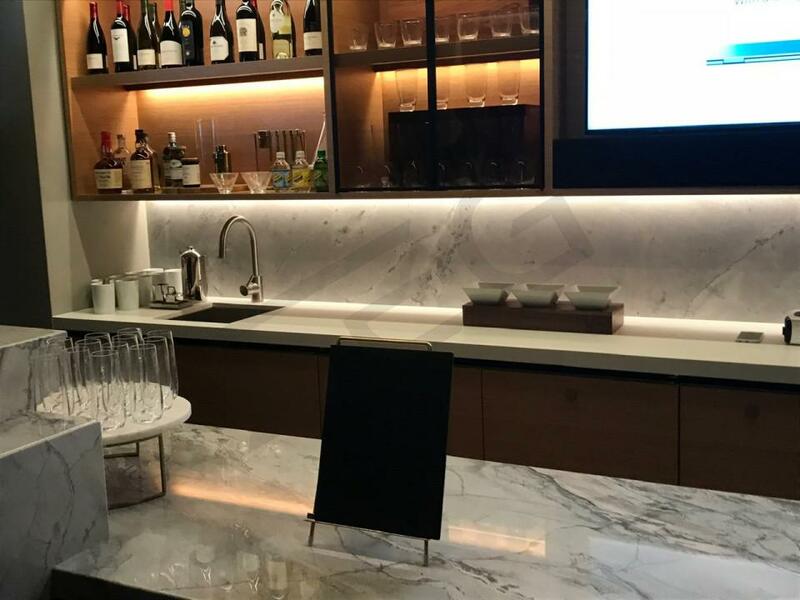 With the emergence of the booming tech sector in Silicon Valley, as well as the rise of the Warriors, the demand has never been higher in the Bay Area to treat corporate clients to a Warriors luxury suite. Despite this perfect blend of corporate demand to purchase suites and the entertainment of the Warriors on the floor, Oracle Arena has been unable to provide a true luxury suite experience for Silicon Valley to enjoy. With the opening of the Chase Center, that all changes. Chase Center will offer a state of the art luxury suite experience with upscale amenities, unique offerings, and a modern touch. The ancient suites from 1966-built Oracle Arena will become a thing of the past. The Bay Area will now have the premium seating experience at Warriors games that both the franchise and its amazing fans deserve. Pictured are the primary level luxury suites at Oracle Arena and Chase Center, respectively. At Oracle Arena the suite is currently referred to as the Concourse Level Suite. At Chase Center, the suite is being sold as a Club Suite. 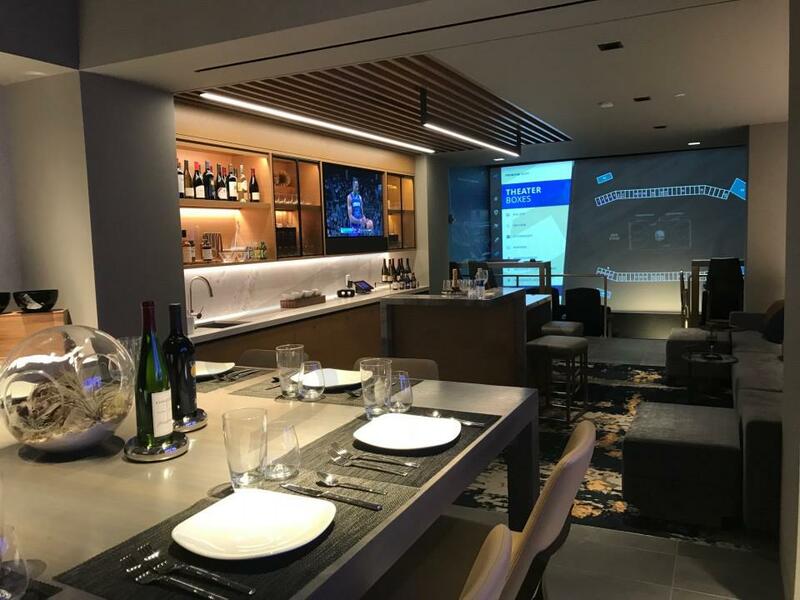 The Club Suite at Chase Center is far more spacious, and it is being sold with only 16 tickets, as opposed to 20 tickets at the Oracle Arena Concourse Level Suite. There will be ample room to mingle with friends or discuss with clients. Highlights of the suite include a dramatic vaulted ceiling, large dining room style table to enjoy the premium food options catered to your suite, and an island bar in the center of the suite to enjoy a cocktail. 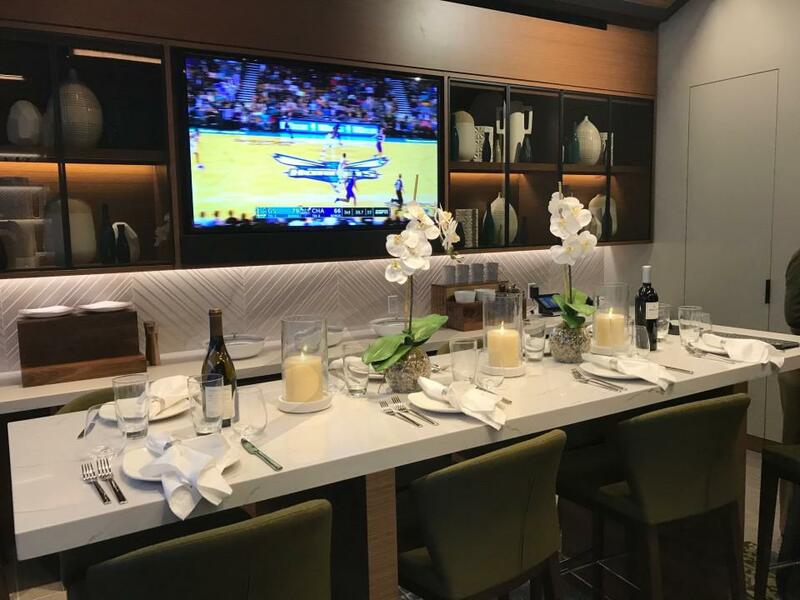 With a full dining room setting, modern designs, and larger layout, the Chase Center suite will provide a far more relaxing and entertaining suite experience. Here are some more photos of what Chase Center suites will look like. A major difference between the premium seating options at Oracle Arena and Chase Center will be Theater Boxes, which are intended for smaller groups still looking for an exclusive, private experience. In all there will be 60 total theater boxes, each of which can accommodate 4 guests. In each box there are 4 plush seats and a dining table for guests to enjoy a smaller, more intimate setting. Guests will have access to the 2 theater box clubs at Chase Center, as well as all inclusive premium food and beverages. With Theater Boxes, Chase Center is changing the game for fans who may not have the guest list to fill an entire 16 person suite. Accommodating 12-16 guests, Courtside Lounges will also provide a new luxury experience for guests at Chase Center. The design and layout is intended to reflect the elegance of Napa Valley, the beautiful wine country to the north of San Francisco. The highlight of the space is a dramatic vaulted ceiling that is modeled after the interior of a wine barrel. 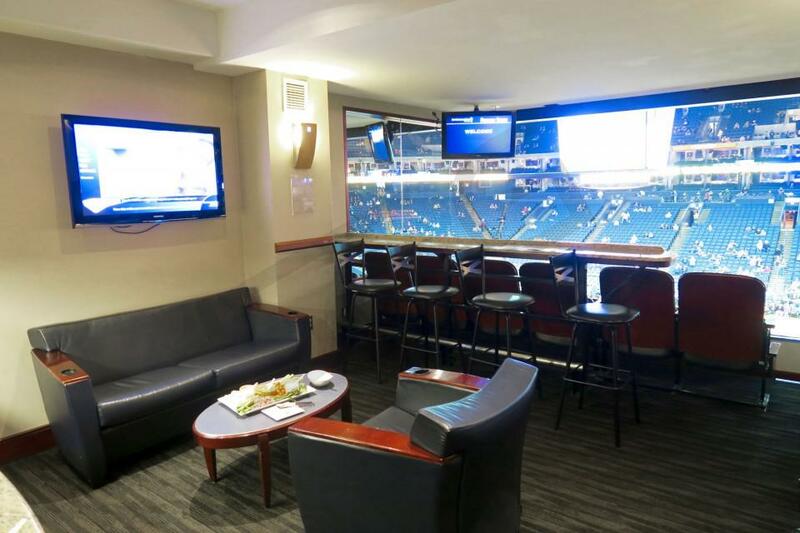 With a large harvest table, private bar, and personal butler, Courtside Lounges provide an exclusive experience. There are also shared wine vaults, where guests can socialize with other Courtside Lounge members and store their personal bottles. The Courtside Lounges truly provide an experience unlike any other in the industry. Get Excited for Fall 2019! In addition to the best show in basketball, Chase Center already has an exciting set of concerts lined up. Chase Center will open up with a concert on September 6th by Metallica, the most celebrated Bay Area band of all time. Metallica will reunite with San Francisco Symphony in what has all the makings of a legendary night. The concert is not only a celebration of Chase Center’s grand opening, but also the 20th anniversary of the two groups coming together. There’s no better way to open up Chase Center than with the best the Bay Area has to offer. The impressive fall lineup at Chase Center also includes John Mayer, Dave Matthews Band, The Chainsmokers, Phil Collins, and The Black Keys. Over the coming months expect Chase Center to reveal an additional list of artists who will perform at San Francisco’s newest hub for entertainment. Chase Center is set to offer the most exclusive premium experiences in the country. Be sure to book with Suite Experience Group to secure a Chase Center luxury box today!